Mark has some of the closest friends in the world. 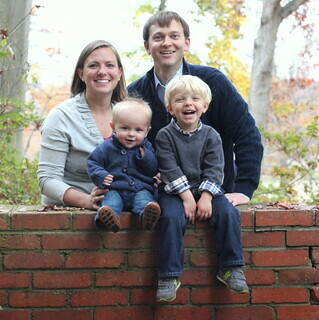 They are great guys that have married great women who have become my good friends too! All of our get togethers have the usual crowd, the same favorite foods, and plenty of cheap beer. It is like things never change...even with the addition of new wives and children along the way. Each year since 2003 we have a Christmas party to end all Christmas parties held by the same couple. The invite is almost always the same, the mixed cd never changes, and we laugh harder than we have all year! 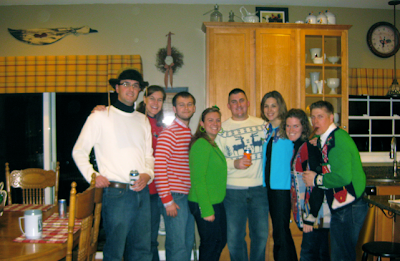 This year we shook things up a bit and turned it into an ugly sweater Christmas/New Years Eve party. As you can tell from our group picture, it was a pretty mild "ugly" to ring in 2010, but we had a blast. We haven't changed much, and that is just the way we like it!